Seated to the right of Iran’s Supreme Leader Ayatollah Khamenei are Iranian Revolutionary Guard Corps (IRGC) Commander, General (Sarlashkar) Mohammad Ali Jafari, Senior Military Adviser to the Supreme Leader, IRGC General (Sarlashkar) Yahya Rahim Safavi and former Iranian Defense Minister, IRGC Brigadier General (Sartip-e Yekom) Ahmad Vahidi. Seated to Khamenei’s left is IRGC Deputy Commander, Brigadier General (Sartip-e Yekom) Hossein Salami. Khamenei will decide whether there will be a final nuclear agreement and whether Iran will fully comply with it. According to a May 14, 2015 Reuters article entitled, “Obama Updates Gulf Leaders on Iran Talks, Seeks Support for Deal,” US President Barack Obama, meeting with leaders from Persian (Arabian) Gulf States at Camp David, updated them on international efforts to forge a nuclear deal with Iran. US Deputy National Security Adviser Benjamin Rhodes stated that the US would welcome support from Gulf States for the deal, which many Arab leaders are concerned would empower Iran to work in destabilizing ways in the region. Rhodes indicated that none of the leaders present had signaled they would pursue a nuclear program that would raise concerns. The Joint Comprehensive Plan of Action signed on April 2, 2015 met core policy goals of the Obama administration for the nuclear negotiations: potential pathways Iran could take toward a nuclear weapon using highly enriched uranium and plutonium were blocked; and safeguards were established to prevent Iran from conducting a covert nuclear weapons program. With safeguards, the administration believes the framework agreement will cut down Iran’s breakout time capacity to the point that it would take at least 12 months to amass enough uranium enriched to weapons grade for one bomb. The number of centrifuges enriching uranium will be greatly reduced by requiring the removal of its installed but non-operating machines and cutting back the stockpile of enriched uranium gas by 97 percent. Uranium enrichment will be performed only at the Natanz Fuel Enrichment Plant. The underground facility at Fordow (Shahid Alimohammadi) Fuel Enrichment Plant will be repurposed for non-uranium research activities. Limits set will require Iran to operate no more than 5060 centrifuges for 10 years. Further measures will ostensibly ensure Iran’s breakout time is markedly reduced before the 10 years lapse. Iran agreed to cap enrichment to reactor-grade (3.67 percent) for 15 years and not to build any new enrichment facilities in that same timeframe. Iran would be required to modify its Arak Heavy Water Research Reactor to greatly reduce its proliferation potential. Iran would be restricted from developing any capability for separating plutonium from spent fuel for weapons. Enhanced international inspections and monitoring would be set up to help discourage Iran from violating the agreement. If it is found Iran has been in noncompliance, enhanced monitoring will increase the international community’s ability to promptly detect and disrupt future efforts to build nuclear weapons at declared or potential undeclared sites. Obama will sense ineffable glory if a final agreement is signed on June 30, 2015 and the agreement holds throughout the remainder of his presidency. However, the specter of potential noncompliance of a final agreement looms despite the best efforts of negotiators. The threat that a nuclear armed Iran would present in part drives the negotiation effort of the P5+1 (US, the United Kingdom, France, China Russia and Germany). Prudent US officials and negotiators set what they wanted to accomplish and how to do it in the talks. Yet, securing a perfect agreement with Iran will not be possible. Deterrence is used in response to the threat of a course of action by an opponent. Economic sanctions have all but been declared as the sole consequence to noncompliance with an agreement, but sanctions might not be enough to restrain hardliners determined to build a weapon. Truly controlling a nuclear ambitious Iran may not be possible. The Iran Talks have not absorbed the national attention of the US public, yet there is support for Obama’s effort. An April 27, 2015 Quinnipiac Poll reported 58 percent of the US public supported the April 2nd agreement on Iran’s nuclear program and 77 percent preferred negotiations to military action against Iran. However, only 35 percent of were very confident or somewhat confident the agreement would prevent Iran from developing nuclear weapons. These statistics are intriguing. Unlike Gulf leaders, when the US public hears senior administration officials speak on Iran’s nuclear program and its intentions in the news media, the matter is oft covered with an artificial mystification. Their words are usually perplexing, and fail to impart any certainty that Iran will comply with the agreement long-term. Accepting what has been achieved by diplomats to reach an agreement so far may create faith that things will work out. Yet, in this case, faith is not a substitute for recognizing the truth. By looking deeper, one may see flaws in the agreement and what it may lack to make it lasting. The mind must process what one sees to surmount what one sees, and animate the intellect in a methodical or formulaic way. Using a simple methodology for examining the Iran Talks will allow those in the US public without professional or specialized knowledge to better evaluate for themselves their progression. The goal would be to reach an objective truth about the talks, not just an opinion. The Roman dictator Gaius Julius Caesar has been quoted as saying: “Fene libenter homines id quod volunt credunt.” (Men readily believe what they want to believe.) It is also true that illusion is the recipe for heartache. Intelligence agencies have countless methodologies available to assess situations such as Iran’s potential to adhere to a final agreement. Developing accurate assessments would require judging well from a set of facts, actions, or behaviors what is genuine and what is false. That is discernment. According to the Greeks, at the most basic level, two actions must occur in the process of discernment. Anakrino is the process of careful study, evaluation, and judgment. It requires one to scrutinize an issue, looking down to up and down again at it, judging, and making careful observations. One must be honest about what is being observed. One must be certain that a preferred outcome is not being imagined. The integrity of one’s observations must be measured. Diakrino is the process of learning by discrimination. It requires separating observations thoroughly by comparison. Comparisons must be made with what is known to be counterfeit with what is accepted as genuine. What is discerned as counterfeit should be rejected and what is authentic should be accepted. Applying anakrino and diakrino to analyze information on the Iran Talks can assist laymen in assessing their outcome. In 2013, hardline elements in Iran sensed that newly elected President Hassan Rouhani could capture the imagination of the US and its European partners making them more pliant to compromise. Rouhani’s choice as Iranian Foreign Minister, Mohammad Javad Zarif, was thought to have the ability to push his Western counterparts toward compromise on sanctions without surrendering Iran’s nuclear rights. Both officials have performed remarkably well at promoting Iran’s interests. Despite months of talks, there is still considerable divergence between perspectives on what has been achieved and projected outcomes. The differences were reflected in the respective reports US and Iranian negotiators prepared on the April 2nd agreement. The Iranian report omits several restrictions and limits that all parties to the talks agreed upon. Perhaps the need to satisfy hardliners in Tehran was reflected in how negotiators in the US and Iran prepared their respective reports on the negotiations. In the Iranian Ministry of Foreign Affairs report entitled “A Summary of the Solutions Reached as an Understanding for Reaching a Joint Comprehensive Plan of Action” and the US report entitled “Parameters for a Joint Comprehensive Plan of Action Regarding the Islamic Republic of Iran’s Nuclear Program”, there is considerable divergence between perspectives on what has been achieved and projected outcomes despite months of talks. The Iranian report omits a dramatic number of provisions which all of the negotiating parties agreed upon and the US duly records in its report. The Iranian report begins by stating the solution reached was not legally binding and only provide conceptual guidelines while the US report explained that the April 2nd agreement was a framework laying out solutions from which the final text of a final agreement would be written. The Iranian report only notes a 10 year period of restriction on uranium enrichment, uranium production, and the construction of new centrifuges after which all activities could resume. No mention is made of Iran’s agreement to curtail enrichment over 3.67 percent for 15 years, to reduce its current stockpile of 10,000 kg of low enriched uranium to 300 kg for 15 years, and not to build any new facilities for the purpose of enriching uranium for 15 years. Further, no mention is made of Iran’s agreement not use the Fordow (Shahid Alimohammadi) Fuel Enrichment Plant for enrichment for 15 years. The Iranian report claims the restriction is 10 years. The Iranians report they can continue to research and development on new centrifuges while the US report claims a restriction on centrifuge research and development will be in place for 10 years. The Iranian report does not mention Iran’s agreement to adhere to a research and development plan submitted to the International Atomic Energy Agency (IAEA). The Iranian report says that the Arak Heavy Water Research Reactor will be redesigned and rebuilt so it will not produce weapons grade plutonium. However, no mention is made of the provision that P5+1 must agree to the design, and that the original core reactor must be destroyed or shipped out of the Iran for the reactors lifetime. Absent also was any mention of Iran’s commitment not the reprocess spent fuel or engage in the research and development in the reprocessing of spent fuel. The Iranian report does not include the provision that grants the IAEA access to suspicious sites or facilities about which allegations might be made of covert enrichment activity, conversion, and yellowcake production anywhere in Iran. That stipulation grants the IAEA inspectors access to military facilities as well. Regarding sanctions, the divergence in positions is huge. The US reports Iran agreed sanctions would be suspended. Iran says it only agreed to their elimination. IRGC Commander, General (Sarlashkar) Mohammad Ali Jafari has offered cautious support for Iran’s nuclear negotiations team, but grumblings among his commanders indicate a final deal would not represent their goals. 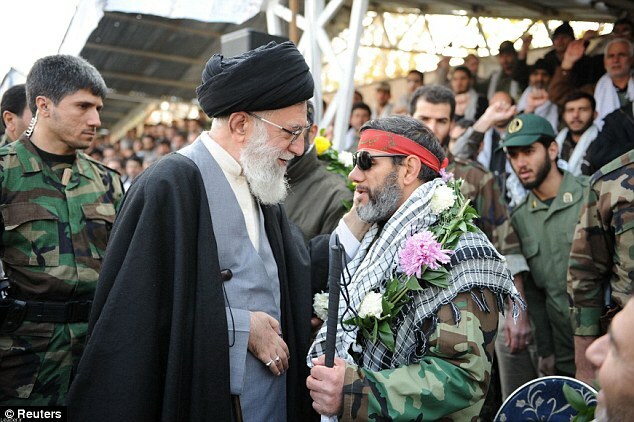 The IRGC would welcome continued opposition and clashes with the West, especially the US. Signing on to a final nuclear agreement with the P5+1 would become a nightmare for Khamenei if he later felt doing so in some way disrespected or disregarded the sacrifices of martyrs of the Iranian Revolution, the Iran-Iraq War and Sacred Defense. Regardless of any benefits of sanctions relief, that concern weighs heavily on his mind. US and European negotiators are well-aware of the great incongruence between their countries’ positions and those of Iran on these issues. To have a final agreement, one side must give way. The IRNA news agency quoted Khamenei as saying, “Our negotiators should continue the talks with respect to our red lines. They should not accept any imposition, humiliation and threat.” Whatever decision Khamenei makes on the final agreement, he must be certain his decision in no way disrespects or disregards the sacrifices of martyrs of the Iranian Revolution, the Iran-Iraq War and Sacred Defense. Regardless of any benefits from sanctions relief, that concern weighs heavily on his mind.